One of the main ideas I hope people takeaway from my recipes is that eating healthy does NOT have to be boring. In fact, we can still enjoy most of the same foods in a healthy manner without sacrificing taste! Take for instance my Plantain Chip Nachos. Unlike a more particularly unhealthier version of nachos, these are made with Barnana plantain chips which are plantains cooked in coconut oil seasoned with Himalayan sea salt. These healthier chips are organic and non-GMO but also high in potassium as well! Then, they are layered with ground bison, radishes, green onion, olives and cotija cheese. 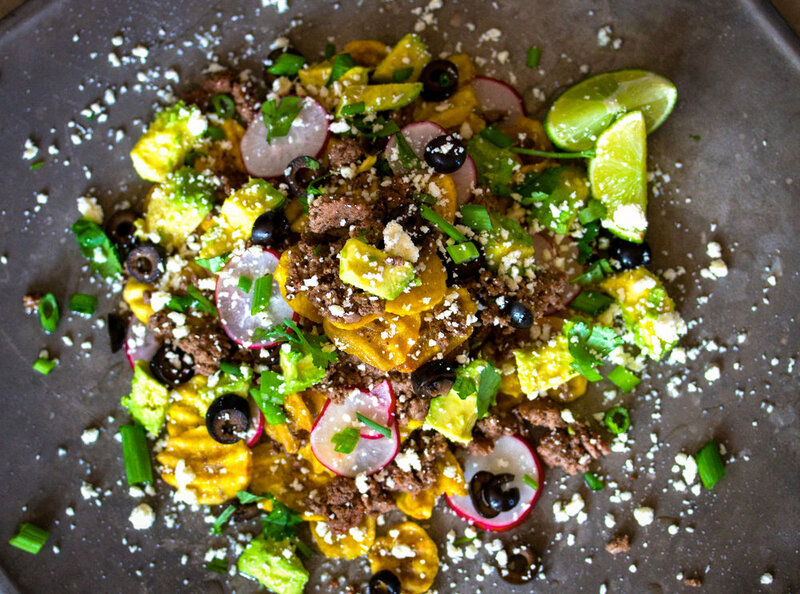 Such a fun, flavorful and fresh take on the classic nachos. Enjoy! Heat ghee in a large cast iron skillet. Add bison and begin to brown. Add in chili powder, cumin, basil, oregano, cinnamon and sea salt then continue to cook until browned. On a serving dish, layer plantain chips, meat, radishes, avocado and olives. Top with green onions, cilantro, cotija cheese and a dash of avocado oil and lime juice.